Gorgeous Reef Dweller Turtle trinket box is hand enameled in turquoise, green, and clear, hand set Austrian crystals. 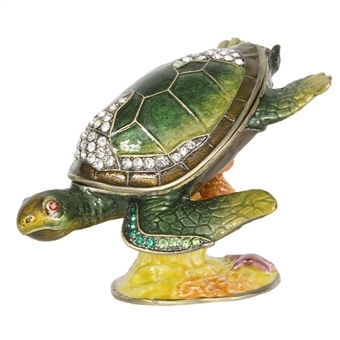 This turtle trinket box makes a wonderful keepsake gift and is an elegant way to store some particularly favorite jewelry treasures within easy reach. The turtle represents health & endurance! Measures 3 1/4" x 2" x 2 1/4" with an opening shell.